China's first lunar rover Yutu (the Jade Rabbit) is still working but cannot move, a scientist with the lunar probe mission told Xinhua. The rover, named after the pet of a Chinese goddess who flew to the moon, was launched in late 2013, but its control mechanism failed on its second lunar day before becoming dormant in January 2014. Yutu, the national pride of the world's third country to soft-land on the moon, was re-awakened, but problems remained. 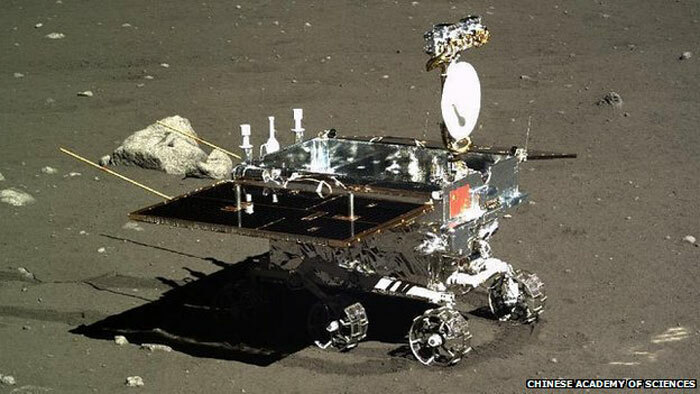 Ye Peijian, chief scientist of China's Chang'e-3 program, said that the resilient rover had survived longer than its design life of three months. "For the time being, it can be re-awakened but cannot move," said the scientist, who is also a member of the National Committee of the Chinese People's Political Consultative Conference (CPPCC), China's top political advisory body. Experts said earlier that Yutu might have been damaged by a rock. Repairing the moon rover could be very difficult with it being 380,000 kilometers from earth and its voltage has dropped after repetitive contraction and expansion due to the 300 degrees centigrade temperature difference between day and night on the moon. The moon has buried scars from an explosive past. That's the lesson from China's Yutu or "Jade Rabbit" lunar rover, which has discovered layer upon layer of past lava flows and explosive eruptions not previously seen. "When you look at an image of this area, there are no features," says Long Xiao from China University of Geosciences in Wuhan. "But when we looked at the inside, there are many stories within it." Jade Rabbit launched in 2013 as part of the Chang'e 3 mission, China's first lander on the moon and the first lunar lander at all in 37 years. It touched down on Mare Imbrium, one of the vast flat craters thought to have been formed long ago by a large impact and filled by a flood of lava about 3.8 billion years ago, which had not been directly sampled before. As it zigzagged along the crater, Jade Rabbit's ground-penetrating radar peered up to 400 metres below the lunar surface. It found evidence for five distinct volcanic events. Xiao says it was a surprise that there were traces left all the way down to that depth because some people have thought the flows may be less than 50 metres deep. An even greater surprise is that some traces appear to be from explosive eruptions rather than gentle lava flows. The third lava layer from the surface, about 240 metres down and about 3.3 billion years old, has a reflection texture that is similar to what is seen on Earth when violent eruptions eject large rocks known as pyroclastic rocks. Evidence from the Apollo missions and from orbiting spacecraft had only seen evidence of basaltic lava, which flows more gently. For the eruptions to be explosive, a lot of gas must have formed. The surface rocks don't contain enough chemicals with low boiling points to make such explosive eruptions. This suggests there might be volatile molecules like water in the moon's interior. Xiao says they've only started figuring out what the data collected by Jade Rabbit means. The next step is to look at more closely to figure out exactly how each layer formed and where the volcanoes would have been. Unfortunately, Yutu is stuck: after 14 Earth days of operation – one lunar day – it encountered a problem and was unable to move, although it is still gathering some data. Another rover is planned for launch this year, ahead of a sample return mission planned for launch in 2017. "Chang'e 3 and 4 is testing the technology – landing in a specific area," says Xiao. "Maybe they will select another landing site for the sample return." WASHINGTON, March 12 (Xinhua) -- The moon's geological history is more complex than previously thought, preliminary results from China's first lunar rover, Yutu, suggested Thursday. Ground-penetrating radar measurements taken by Yutu, also known as Jade Rabbit, revealed at least nine subsurface layers beneath its landing site, indicating that multiple geologic processes have taken place there. "We have for the first time detected multiple subsurface layers (on the moon)," said lead author Xiao Long, professor of the China University of Geosciences in Wuhan, attributing these layers to ancient lava flows and the weathering of rocks and boulders into regolith, or loose layers of dust, over the past 3.3 billion years or so. One of the most interesting findings is a layer at depths of 140 meters to 240 meters, said Xiao, who is also professor of Macau University of Science and Technology. "We think this layer is probably pyroclastic rocks which formed during the course of volcanic eruptions," Xiao told Xinhua via email. "It reveals the diversity of volcanic activity, but what's more important is that it shows there are plenty of volatile contents inside the moon." Yutu is part of China's Chang'e-3 moon mission, which delivered the rover and a stationary lander to the lunar surface on Dec. 14, 2013, marking the first moon landing since the Soviet Union's Luna 24 mission in 1976. It touched down on the northern Mare Imbrium, also called Sea of Rains, a region not directly sampled before and far from the U. S. Apollo and Luna landings sites. Yutu traveled a total of 114 meters following a zigzagging route, then came to a halt about 20 meters to the southwest of the landing site due to mechanical problems. So the rover just surveyed a small area using two radar antennas capable of penetrating the Moon's crust to depths of about 400 meters. The data, however, were enough to show its landing site is compositionally distinct from previous Moon-landing sites, the researchers said. "Overall, we have already had a general scientific understanding of the moon thanks to these lunar missions," Xiao said. "But if we want to have a comprehensive understanding of moon's geological structure, material composition and formation, as well as its evolution, a large number of exploration events are still needed. Meanwhile, effective international cooperation is a must considering the high cost of these activities." The findings were published in the U.S. journal Science. Findings from China's first moon rover Yutu, or Jade Rabbit which is the only scientific probe to land on the Moon in almost 40 years, are rewriting lunar history. Analyzing data sent back from Yutu, scientists find that a large volcanic eruption happened at its landing site, a basin called Mare Imbrium, about 2.5 billion years ago. Previously it was believed the Moon had seen little geological activity since 3.1 billion years ago. "It's like an old man in a wheelchair who can suddenly run again," says Lin Yangting, a researcher at the Institute of Geology and Geophysics, the Chinese Academy of Sciences (CAS). When there's little geological movement and a planet or moon is an icy rock, the planet is in its old age or already dead, scientists say. The Moon is a case in point, explains Lin, while the Earth is now in its adulthood, and quite active. 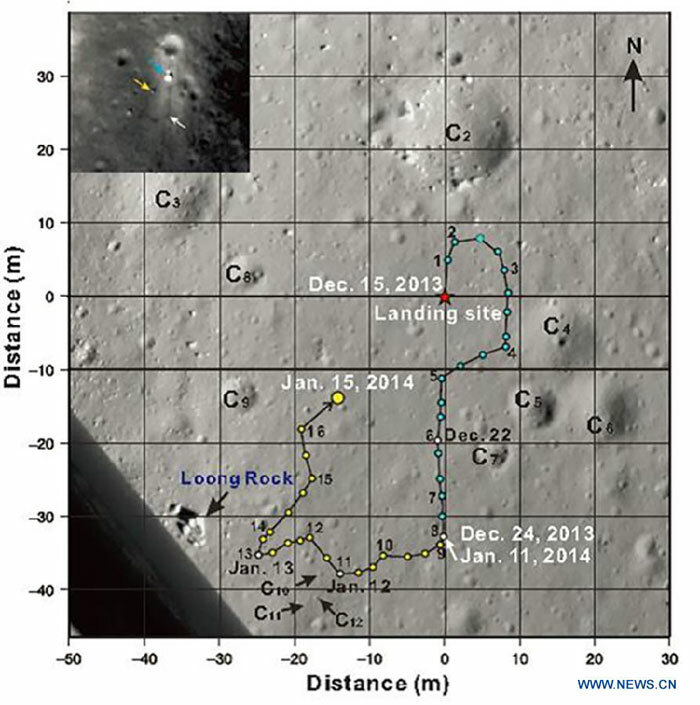 On December 14, 2013, the Chang'e 3 lunar craft and Yutu rover performed a soft landing in the northeast of the Mare Imbrium, on the nearside of the Moon. Though Yutu encountered operational difficulties after moving just 114 meters, it gathered some useful data. The CAS assigned five interdisciplinary teams to study the data. Lin leads one of the teams, and its findings have been published in the latest issue of a U.S. journal, Proceedings of the National Academy of Sciences. The surface of the Moon features numerous large basins caused by bombardments of asteroids about 3.9 billion years ago. They were filled with dark basalt lava flows from volcanic eruptions, mainly during a period from 3.8 billion years to 3.1 billion years ago. The eruptions produced layer after layer of basalt stacked in a vertical sequence, which, scientists believe, hides the history of the Moon. Among the sophisticated instruments Yutu carries, the lunar penetrating radar (LPR) helps see below the surface. The LPR data indicates three underlying basalt layers measuring 195 meters, 30 meters and 130 meters from the top at the Mare Imbrium. "That shows the upmost layer of the basalt is quite thick," Lin says. Satellite images show the upmost layer of basalt on which Yutu landed is large and dates back to 2.5 billion years ago. "For the Moon, 2.5 billion years ago was its late years in terms of geological activity, but the facts show a very large volume of basalt lava erupted at that time," Lin says. Using LPR, Yutu for the first time carried out an in-situ measurement of the thickness of the lunar regolith layer, also called lunar soil, which was about 5 meters deep. "The figure is significantly deeper than what we expected for a young mare site," Lin says. The thickness of the lunar soil was estimated to be 2 to 4 meters in the mare and up to 8 to 16 meters in the highland areas. "We think the thickness of the lunar regolith layer was underestimated," Lin says. Scientists believe many important resources such as helium-3, believed to be a promising future energy source, can be found in the lunar soil. Spectral analysis showed the soil beneath Yutu has similar mineral contents to the lunar soil samples taken back to the Earth by the U.S. Apollo missions. Chinese scientists detected 12 chemical elements, including four trace elements in the lunar soil. They also found higher iron oxide (FeO) and titanium dioxide (TiO2) concentrations and lower aluminum oxide (Al2O) concentrations than in the samples collected by the lunar missions of the United States and the Soviet Union. These findings suggest a new type of basalt beneath, which has not yet been sampled, Lin says. Another important finding of Lin's team related to KREEP, a special geochemical component on the Moon. KREEP is an acronym formed from the atomic symbol for potassium, rare earth elements and phosphorus. Scientists believe KREEP is related to the origins and early history of the Moon. It is now believed that a rocky object about the size of the Mars struck the Earth about 4.5 billion years ago. This collision threw a large amount of melt and vapor into orbit around the Earth. These high temperature materials ultimately formed the Moon. Given the energy generated by this collision, it has been deduced that a large part of the Moon would have been liquefied, and this formed a lunar magma ocean. As the melt crystallized, minerals such as olivine and pyroxene precipitated and sank to the bottom to form the lunar mantle. And the material anorthosite plagioclase floated because of its low density, forming a solid crust. Elements that are usually incompatible would have been progressively concentrated into the residual magma. Thus a "KREEP"-rich magma was formed between the crust and mantle. Lin says data from Yutu show that the basalt beneath the rover contains 10 to 20 percent KREEP substances. "We think the substances were added to the basalt when the lava went through the KREEP-rich layer during volcanic eruptions," Lin says. The finding is new evidence supporting the lunar magma ocean hypothesis. Lin believes that the Moon probe will help in understanding the early history of the Earth. Moreover, the Moon could be a base for deep space exploration in the future. "The Earth and the Moon share similar experiences in their origins. The early history of the Earth, which has been erased in the frequent geological activity, can be studied on the Moon," he says.